I received a shipment of frames today so tomorrow I will unpack them and frame some pieces to take to the Art League on Monday. I enjoy framing my paintings. I like to put on an old movie when I frame and just relax. I can't decide what I want to start next but I have a number of paintings in mind and will start sketching them out. I do need to have a black and white in play because so much of my work time is stretching into the evening. I can work on the black and whites in changing light much more easily than works in color. GYPSY UPDATE: She is doing really, really well. I spend the mornings with her and usually get home around 1:30. We have a routine down and she seems to thrive on it. I hand walk her and graze her everyday and as I look at her it is as though she is slowly being inflated back to her normal self. The weight is finally starting to come back on. I have been taking photos and will choose a good one to upload on my next post. If you go back to my post on August 16th you will see the start of this painting on my easel at Daingerfield Island on the Potomac. My desire was to go back to that site to complete the painting but it seems that the only times available to me were ones that weren't very good for working on this piece. Today would have been wonderful because it was sunny, the skies brilliant and the temperature perfect. A nicer day than the one when the painting was begun. 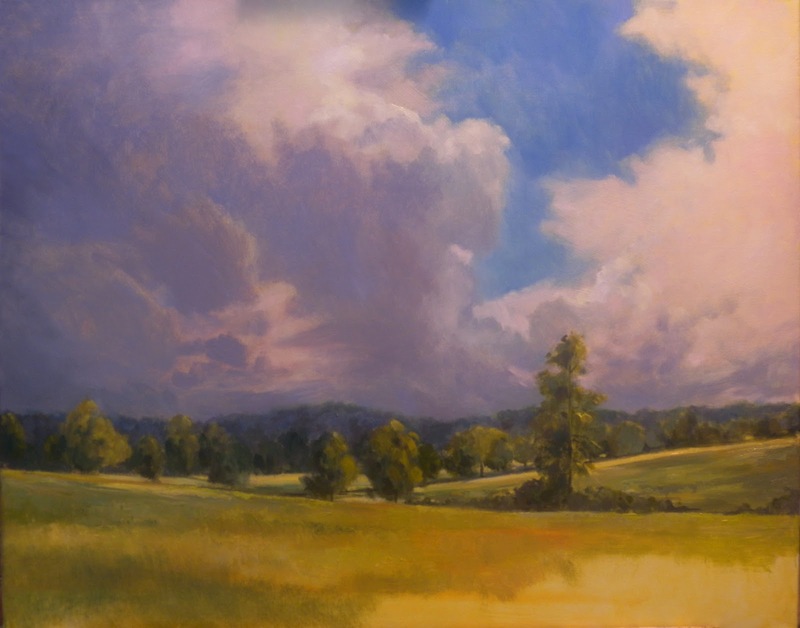 So, since there wasn't the time to get to Daingerfield I worked on the painting in the studio and only had to look out the windows to see the sky I wanted in the painting. The clouds had already been added on the 16th but the colors in them were more intense late this afternoon as was the blue of the sky.I am keeping it loose as I do when painting plein air and you can see that I have chosen to let some of the underpainting show through as it represents the light hitting the water surface in those areas. 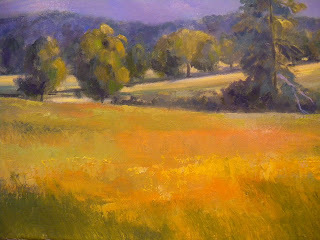 The underpainting I used was a wash of cadmium orange. I often use that for sunny day paintings. As you can see I have begun adding the boats and am pleased with this placement of them. I won't need much time tomorrow afternoon to finish this. My studio is filled with summer paintings and I have them lined up around me for inspiration. I wish there was a place I could exhibit them all together. Because of my need to care for my horse Gypsy this summer I didn't paint out as often as I usually do this time of year but somehow managed to put together a good series of paintings. They are happy paintings. I wonder how they will look combined with my fall paintings from last year and I will lay some of those out with them tomorrow. It is a good way to see where I am going stylistically. I seem to have evolved into impressionism. Interesting. 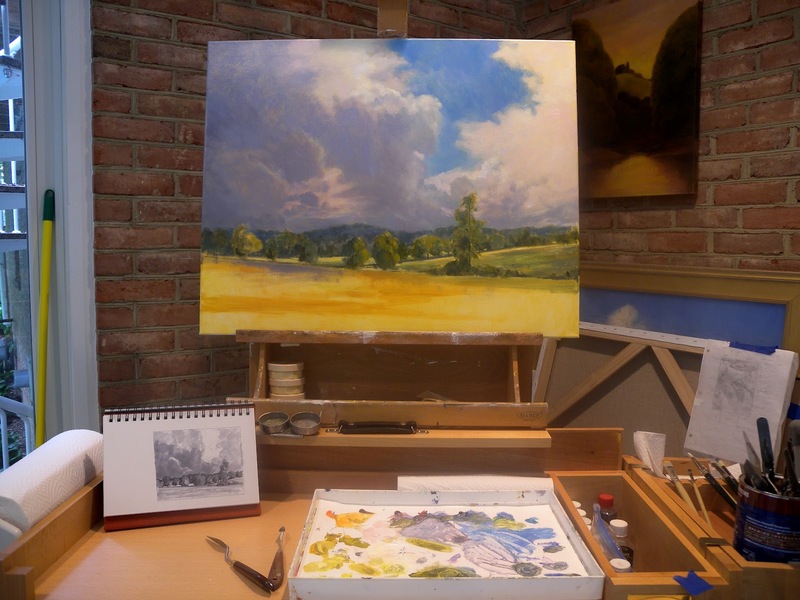 How I paint plein air has affected how I paint in the studio and I think it is a good thing! Regarding my website.... what began as procrastination has turned into thoughts about rearranging it. I am glad I didn't go ahead and upload everything as I think I will create new pages to divide the work up more. I have actually begun to plan it so I should have it completed soon. If you have never visited it before you can click on this linkwww.jeanschwartzpaintings.com Also, visit the Salmagundi online exhibit at www.salmagundi.org. It is the "Summer Potpourri" exhibit of member works. Go to the bottom of page 13 and the top of 14 for my paintings. 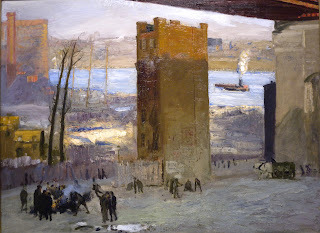 "The Lone Tenement" by George Bellows 36 1/8"x 48 1/8"
Today my husband and I spent the afternoon at the National Gallery of Art here in Washington DC to see the huge exhibit of paintings, drawings and prints by George Bellows. Jaw dropping! I have seen many a wonderful exhibit here at the NGA but I think this one tops them all! The painting I have posted here belongs to the NGA permanent collection and I took this photo back in January when it was hanging in its usual spot in the American galleries. Today while part of this enormous, special exhibit I was unable to take pictures of it or any other painting in the show which is customary in a special, travelling exhibit. There were so many Bellows paintings here beyond what I have seen in my lifetime either at museums or in books. The accompanying exhibition catalogue is a gem and was a must buy for me. It is packed with color plates some taking up both pages and the colors are spot on. I was relieved because there are so many paintings I want to remember and study. The River scenes are my favorites and this painting "The Lone Tenement" has been one of my favorites for a long time. Another thing that struck me was the remarkable condition the paintings are in. Some of the sea scapes look as though they were just painted they were so fresh. Happily the show is up until October 8th which will allow for repeat visits and it is free. It will be travelling to the Metropolitan Museum of Art in NYC next and then to the National Gallery in London. If you are able to visit any of these institutions I doubt you will be disappointed in this exhibit. So, what have I been up to? I haven't had time to blog, that's for sure. I have been taking photos of paintings, varnishing, framing and getting show entries in. 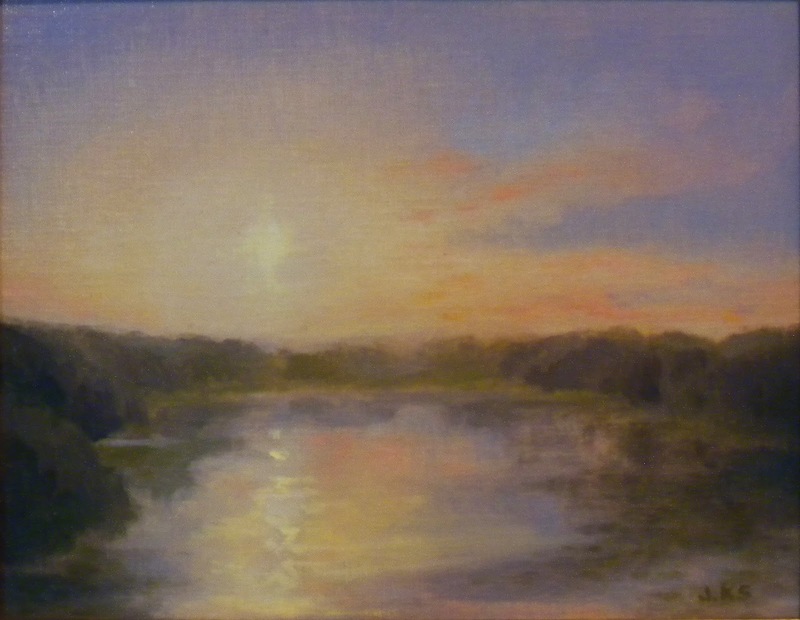 I will upload more photos ( as soon as I take them) of the three paintings I am sending to the Salmagundi Club for "Sunrise, Sunset". Pictured above is one of the three, all of which are part of a series of paintings I did in preparation for "Erik's Pond". I have been doing some sketching for new paintings and I must say that after seeing the Bellows exhibit I am itching to do some more cityscapes. I guess you could say I am in organization and planning mode. 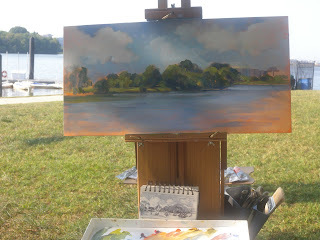 I also want to finish my Daingerfield Island painting and it would be great to get back there this week. I won't bother to say "more tomorrow" because I don't seem able to keep that promise. After all painting is the main thing and I am sure you get that. Lastly, I want to recommend the Art League Inc.online auction of faculty paintings that begins at 6:00 PM this evening and runs until 5:00 PM on the 28th. If you go to www.theartleague.org click on the symbol for our blog at the bottom of the page. A couple of posts down you will find and article on the auction and a direct link to the auction site. I didn't write it down but I think it might be www.32auctions.com and at least if this doesn't work you will know how to find it. The opening bids are low and the work is by award winning, prominent artists. Check it out, you may find something. Today was a long but extremely pleasant day. I spent the morning at the barn with Gypsy hand walking and hand grazing her and then headed home for lunch. Afterwards I headed to the Washington Sailing Marina on Daingerfield Island to paint with Bobbi Pratte who is a friend and fellow ALPAP (Art League Plein Air Painter). We found a wonderful spot in the shade of a large tree on the point and could watch the action around us. 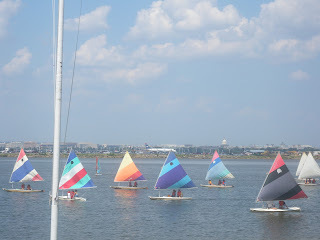 People were fishing, sailing school was in session and in the distance you can see the end of the runway at Reagan National Airport. Planes landing and taking off added to the entertainment. This second photo gives you an idea of what I was after in my painting. 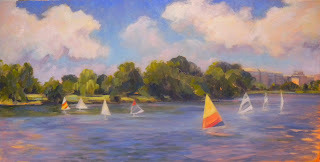 I left out the foreground objects and concentrated on the landscape, river and the boats. The sailing school reminded me of dancers entering a stage. They come around the point single file then circle and follow the directions from the instructor who is in a launch. I did a quick sketch because I knew the boats wouldn't be around for long. 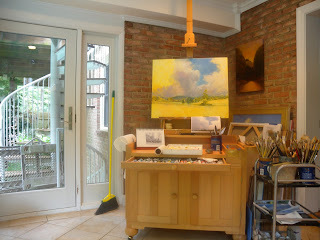 Usually I stand when I paint but today I was pretty tired so I sat at my easel. Having the easel lower to the ground proved to be wise because the afternoon became quite windy and I had to clamp my panel down well. You can see the little sketch I did illustrating my concept for the finished painting. Both Bobbi and I agreed that today painting was a good excuse to sit and relax and enjoy a lively conversation in a resort like atmosphere. We did quite a lot of brain storming for future ALPAP events. This photo shows the painting where I left off. Around 5:00 PM hunger proved a strong motivation to head home. I have a strong start on this one and I know where I want to go with it. The wise thing would be to leave it until next week and come back to this spot to finish but I am already itching to work on it. I have enough information on the panel and in the sketch and photos. We'll see. 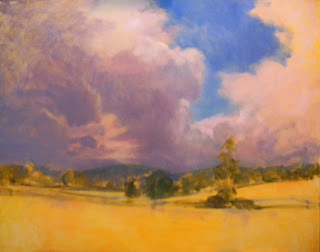 www.jeanschwartzpaintings.com and....That's right folks, I still haven't updated my website. I am hopeless! www.salmagundi.org "Summer Potpourri" is still on exhibit online. Good show! In the view seen in this painting I have my back to the subject of my next painting which looks towards the Blue Ridge Mountains. That will be of a day with a very blue sky and frothy white clouds. Tomorrow I will start a sketch but most of my studio time will be taken up with framing, gessoing and varnishing. While doing those simple things I will be thinking of the new painting. Below are a couple of close up details of "Storm Clouds". I think both details could stand on their own as finished paintings. As you can see, I had fun with my palette knives! detail of ' Storm Clouds"
detail #2 of "Storm Clouds"
Saturday afternoon I got back to work on "Storm Clouds" and took this picture when I had to break for the day. It is all falling into place very easily. Sometimes they just flow from beginning to end and happily this is one of those paintings. I will have to take a close up when it is done as you can't really appreciate the texture when seen from a distance. I am using both brushes and palette knives and working quickly and spontaneously. I have my sketch for reference and sky photos to refer to as well but mostly this one is in my head. I had plenty of time to stand and imprint it on my mind while grazing Gypsy. Today, Sunday, I made quite a lot of progress and would have finished it if the light had not died on me. It was time to stop and prepare dinner and rather than go back to work after dark I thought it best to wait until tomorrow to finish up. This photo is a little dark because I wanted to take it without the studio lights on which would have given quite a golden cast to it. 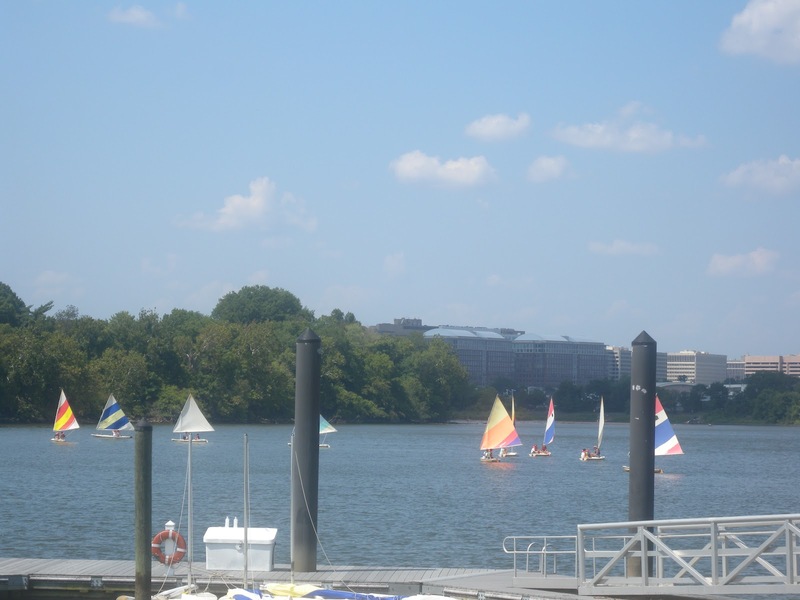 The colors in the clouds to the right are more like you see them in the photo from Saturday. There are at least two more paintings from this series that I will do in progression. I know for sure I have another linen canvas this size but I might not have a third. I would like all three to be 24x30 and I have already decided how I want them framed. www.salmagundi.org Visit the online exhibit "Summer Pot Pourri" and check pages 13 & 14 to view my paintings. "Evening Descends on Black Pond" and "Winter Gold"
Left side of the studio with the start of "Storm Clouds"
I am ready for some new beginnings. 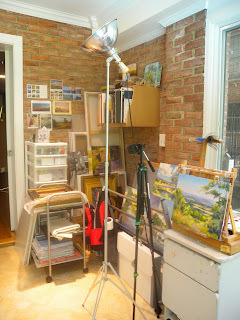 I reorganized my studio in anticipation of the work station I was purchasing from an artist friend who works in pastel. She found that the Todd Rieffer work station did not suit her needs and wondered if I would like to purchase it. I jumped at the chance! It works perfectly for me. Temporarily I am using my plein air palette but I will be purchasing a sheet of glass to cover that entire space you see the palette, sketch book and can of knives sitting on. That will then be my palette area. 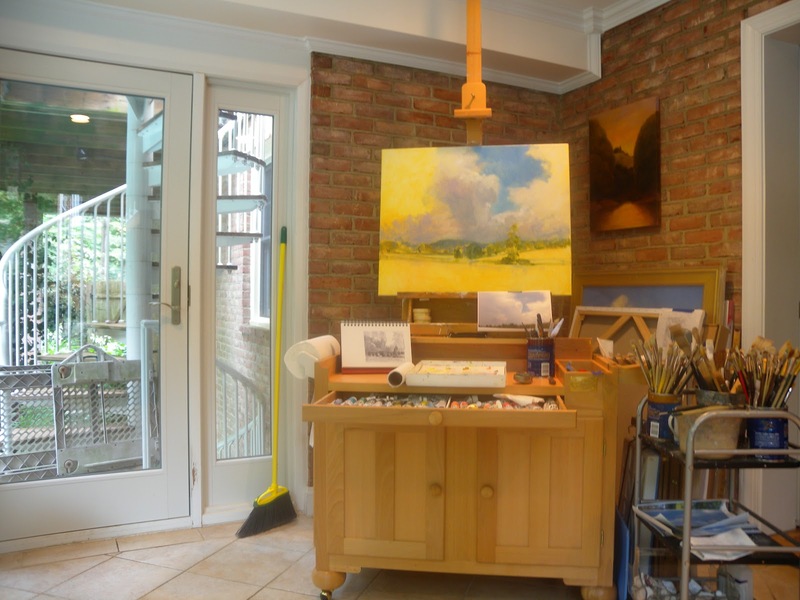 I am the perfect distance from my easel and there is a roll top that covers the open space you see. That helps to keep the paint on the palette space moist as well as providing a great surface to do some framing on. I now have everything I need in easy reach plus I have added to my storage space. I am a happy camper. That is the left side of the studio. I have left the center of the room empty so I can walk back and forward as I paint. 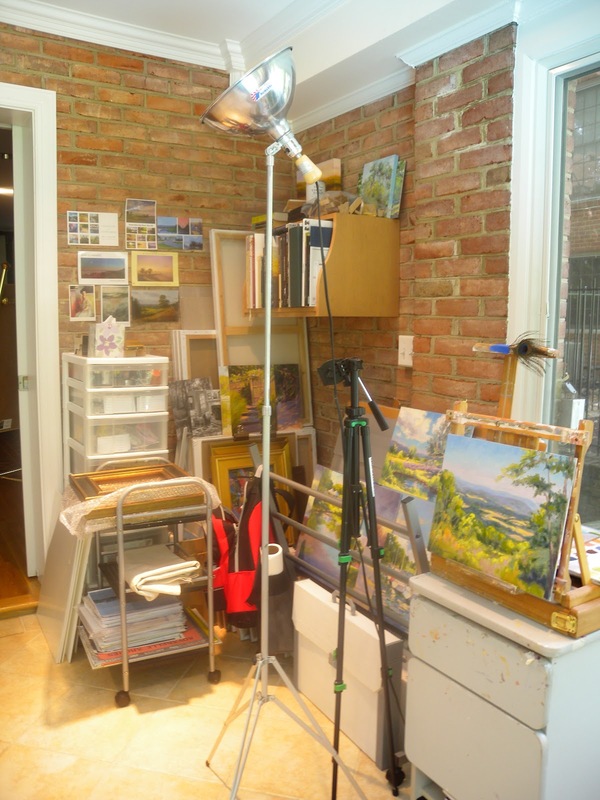 Below is the right side of the studio with my small taboret and table top easel. I have a chair on casters that I use when painting at that station and I can zoom back and forth across the room on the chair. I love this! 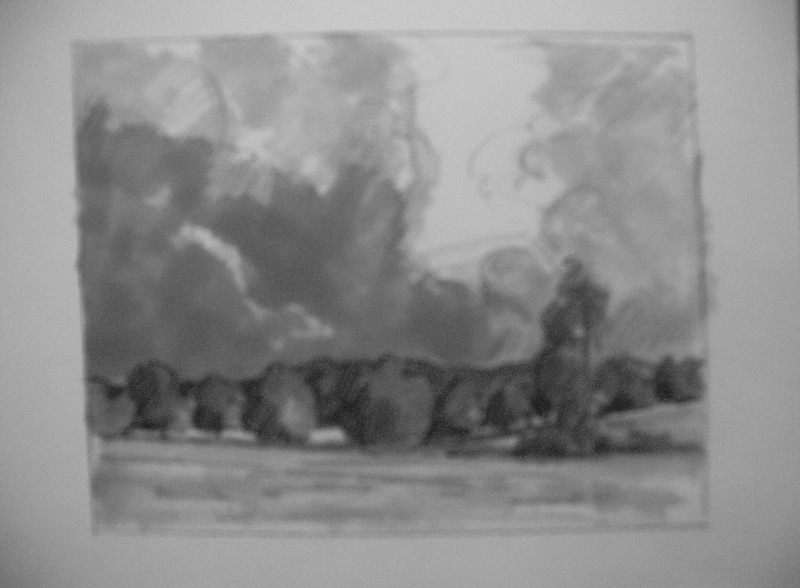 sketch for "Storm Clouds Over Morven Park"
In the first photo you can see the beginning of my latest painting, "Storm Clouds Over Morven Park". I had toned the linen canvas with yellow ochre and this afternoon put in the first couple of hours work on this painting. To the left is the graphite and Prisamcolor marker sketch I did for the painting and you can see this small study sitting on the work station in the first photo. Morven Park is in Leesburg Virginia and is the property immediately adjacent to the Marion Du Pont Scott Equine Medical Center. As you have already read below, I spent 19 days there with my horse Gypsy. When I was finally allowed to hand graze her I found myself surrounded in every direction by magnificent vistas. Paintings began to form in my mind. 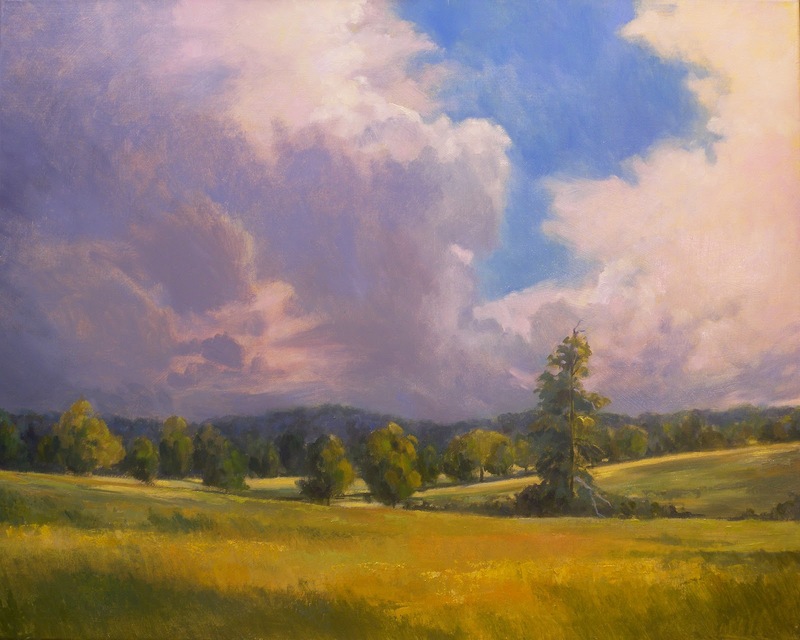 I will definitely be going back there this fall to do some plein air paintings but meanwhile I have plenty of material to work from in the studio. This is just the first studio piece in that series. This is where I left off this afternoon and I am happy with this start. I hope to show you more tomorrow. Please take a few minutes to view the online exhibit at the Salmagundi Club in NYC (47 5th Ave. NY, NY) at www.salmagundi.org The exhibit is "Summer Pot Pourri" and I have fall and winter paintings in that pot pourri, so no, it is not a selection of summer paintings. 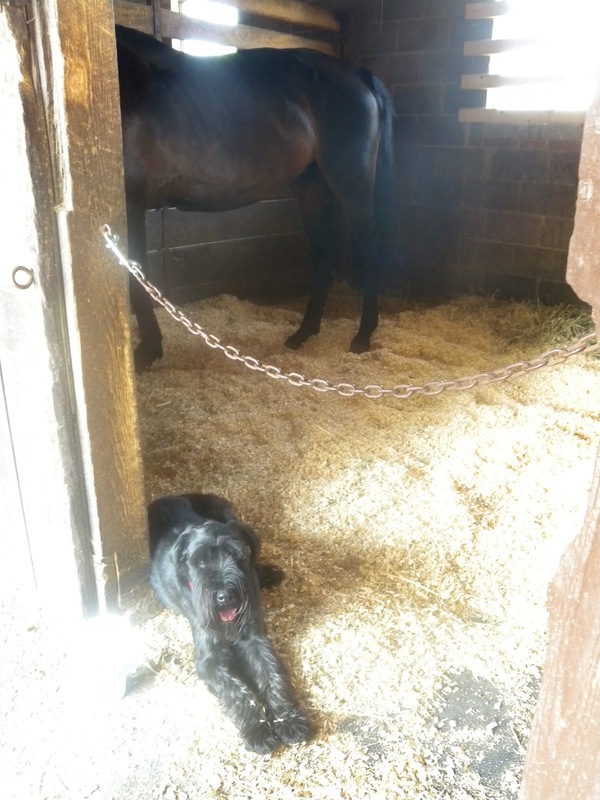 After 19 days at the Marion Du Pont Scott Equine Center I was able to bring Gypsy home on Monday. She is as happy to be home as we are to have her. That is not to say she wasn't happy at the Center. 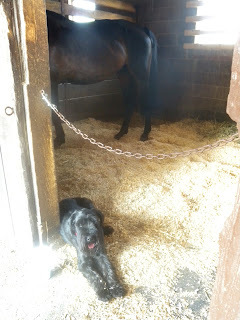 Once out of isolation she enjoyed being in one of the barns with other horses and regular activity around her. I was there everyday. Still, home is home. The photo to the left was taken today by Ariana's mother whom I have known since she was a little girl. Like Ariana she too attended summer horse camp and grew up to be an avid rider and now a doctor. Sometimes I feel older than dirt! Being back home means less time on the road traveling to visit Gypsy and we are able to get back to our usual routine. Mornings are spent at the barn and afternoons in the studio. Today I took some time to get organized. I need to be ready to enter paintings next week for the annual Landscape Show at the Art League Gallery and I just spent time getting photos of my paintings together for an update of my website this week. 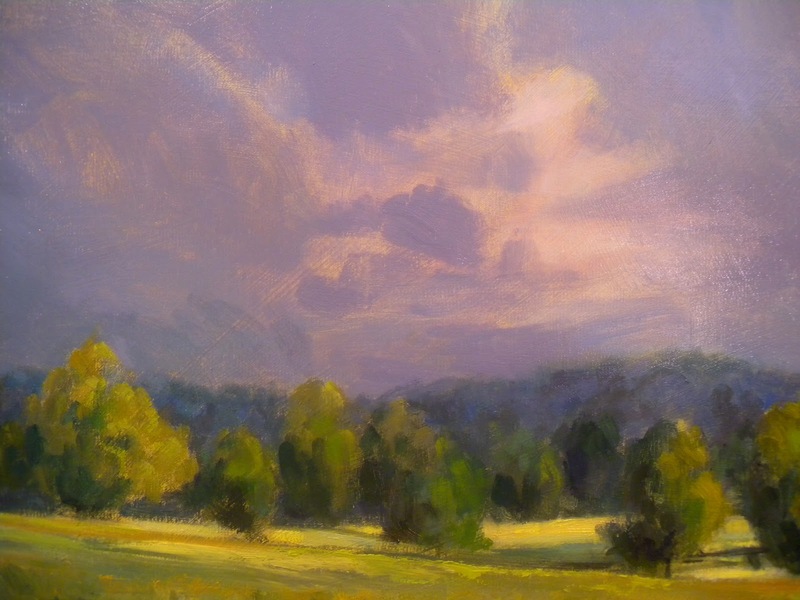 I signed works I had forgotten to sign and while doing that I realized I had never shown you the last painting I did at the workshop at Willow Pond Lavender Farm. I can't believe that was only a month ago! ﻿ You can check under June to read the posts about that wonderful weekend. 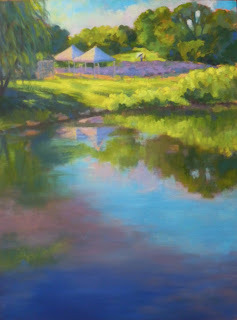 The Hickory Bridge painting was of the farm where I was staying and the other two were both painted that Saturday at Willow Pond Lavender Farm. This one was painted on Sunday morning before I left for home. I think I posted an image of it on the easel and then I just finished it up later that week after I got home. I pulled it out today to sign it (as you can see I had forgotten to do that) and when I did I took out one from last August that I had forgotten about and never signed or uploaded to my website. 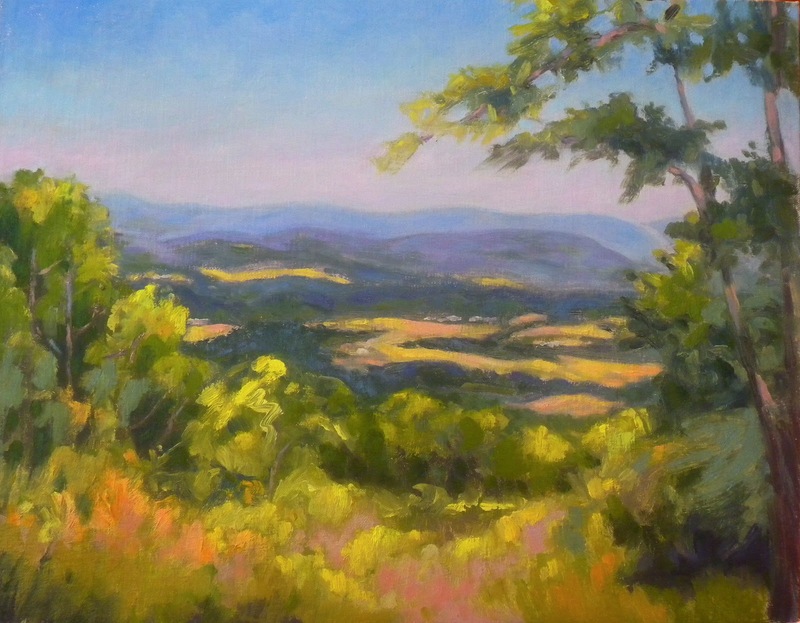 It was painted from the summit of Sugar Loaf Mountain in Maryland and I was looking towards Virginia. I do remember posting about it because that was one of the paintings that the wind picked up and dumped face down in the dirt. In any case, I photographed it for my website because I decided I liked it and it looks good with the rest of my summer paintings. www.jeanschwartzpaintings.com Check towards the end of the week. There will be new work on the Small Landscapes and Black and White pages.